© Muhammad Sadiq/EPA-EFE/Shutterstock Afghan President Ashraf Ghani, center left visits the grave of Lt. Gen. Abdul Raziq, an Afghan police commander who was killed in Kandahar. At least two Americans were injured in the shooting that occurred on Oct. 18, 2018. American military officials said Wednesday that they had halted most face-to-face contacts with members of the Afghan security forces, and have temporarily withdrawn from Afghan security facilities, after two “insider” shootings in the past week that killed a top Afghan regional police commander and a Czech soldier. A spokesman for Resolute Support, the U.S.-led military mission in Afghanistan, described the move as “standard” practice after “green-on-blue” attacks — or assaults by Afghan security personnel against foreign forces. He said “regular contacts” were continuing by telephone and email between U.S. and Afghan security officials, with some meetings also taking place in U.S. facilities. The Resolute Support spokesman, Army Lt. Col. David Butler, said the precautionary measures were taken after the shooting in western Herat province on Monday that left a Czech soldier dead and two wounded. 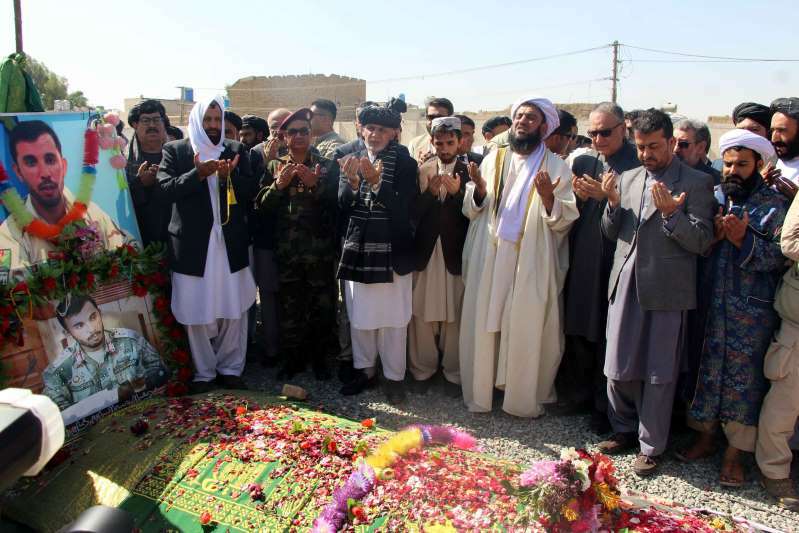 But the steps also reflected rising concerns about the safety of American and other foreign forces here following the assassination in Kandahar province of Lt. Gen. Abdul Raziq , four days before the Herat killing. That slaying created a dangerous security vacuum in the south and fueled rumors that the United States had been behind the plot to kill Raziq — a charge American officials dismissed as absurd. The Kandahar attack, which also killed the province’s intelligence chief and left its governor severely wounded, came shortly after a meeting that was attended by the top U.S. military commander in Afghanistan, Gen. Austin “Scott” Miller. He escaped unharmed and quickly returned by helicopter to Kabul, but another U.S. general and two other Americans were wounded. The Taliban asserted responsibility for the assault, and Afghan officials said it had been planned in next-door Pakistan. Pakistan’s Foreign Ministry denied that charge. The fact that Miller was spared while a revered Afghan security leader died triggered a wave of angry public speculation about an American conspiracy. Afghan and foreign observers here compared the situation to a 2012 incident in which rumors spread that copies of the Koran had been destroyed on a U.S. military base, leading to riots. Although the Taliban also asserted responsibility for the Herat shooting, there were media reports that the Afghan who fired on the Czech soldier was not an insurgent infiltrator but a bona fide soldier who was upset about Raziq’s death and possibly further angered by accusations on social media that the Kandahar attack was a U.S. plot. Those allegations were strongly rejected by top Afghan officials. The two assaults have raised new concerns over attacks against coalition personnel by Afghans in uniform, which have killed about 155 U.S. or coalition troops or contractors and wounded 200 since 2008. Such insider attacks peaked in 2012 but have declined steadily since then, with added vetting of Afghan recruits, extra guards accompanying foreign advisers, and the withdrawal of most foreign troops. However, there have been several such deadly attacks in the past two years, including some at the hands of highly-trained Afghan commandos. The atmosphere has been tense across the country in the past week. Parliamentary elections were held Saturday, but they were marred by scores of attacks by Taliban insurgents, including a suicide bombing outside the capital that killed at least 15 people. Voting was delayed by one week in Kandahar after the Thursday shootings and rescheduled for Saturday, but security concerns could postpone it again. Analysts said it was not clear what impact the latest violence would have on Afghan and American efforts to promote peace negotiations with the Taliban . A newly appointed U.S. envoy for the Afghanistan peace process, Zalmay Khalilzad, visited the region recently and reportedly met in Qatar with Taliban officials, who said publicly that they hoped to continue the discussions. U.S. officials have not confirmed that those talks were held. Kandahar is still in an uproar over the death of Raziq, a tough anti-Taliban fighter who had kept the region stable almost single-handedly. U.S. military officials said Miller had returned there this week and discussed how to reduce security risks with local leaders, adding that the attack there had also spurred a broader reassessment of whether there is enough security in place for about 14,000 U.S. and other troops who are training and advising Afghan forces. “Everyone is taking this deadly seriously,” said one Western diplomatic source, speaking on the condition of anonymity because he is not authorized to make public statements. He said officials with the U.S.-led coalition are being “very sober but not hyperbolic” about the recent attacks and are “extremely sensitive” to the possibility of a repeat of the rioting after the incident involving a supposed Koran-burning, which badly damaged U.S.-Afghan relations for some time.